FROM THE NORTH: Enter Flagstaff via Highway 180 from Grand Canyon or Highway 89 from Cameron. Follow signs to Interstate 17 to Phoenix. Exit at Pulliam Airport (Exit 337) and turn right. Continue straight through the stop sign toward Coconino County Fairgrounds. Follow the one-way loop road, curving left, and then follow the signs. -- FROM THE SOUTH: Drive toward Flagstaff on Interstate 17. Two miles south of Flagstaff exit at Pulliam Airport (Exit 337) and turn left. Continue straight through the stop sign toward Coconino County Fairgrounds. Follow the one-way loop road, curving left, and then follow the signs. -- FROM THE WEST: Drive toward Flagstaff on Interstate 40. Follow signs to Interstate 17 toward Phoenix and Sedona. Exit at Pulliam Airport (Exit 337) and turn right. Continue straight through the stop sign toward Coconino County Fairgrounds. Follow the one-way loop road, curving left, and then follow the signs. -- FROM THE EAST: Drive toward Flagstaff on Interstate 40. Follow signs to Interstate 17 toward Phoenix and Sedona. Exit at Pulliam Airport (Exit 337) and turn right. Continue straight through the stop sign toward Coconino County Fairgrounds. Follow the one-way loop road, curving left, and then follow the signs. Active, National Guard, Retired, 100% DAV, DoD/NAF Civilians, Guests, and more. See Ft. Tuthill website for a complete list. Year round. RV Sites closed October 15th for the season until May 1st. Accepted 24/7. Recommended. Active duty 12 months in advance. All others, 6 months in advance. Modem access in laundry room. 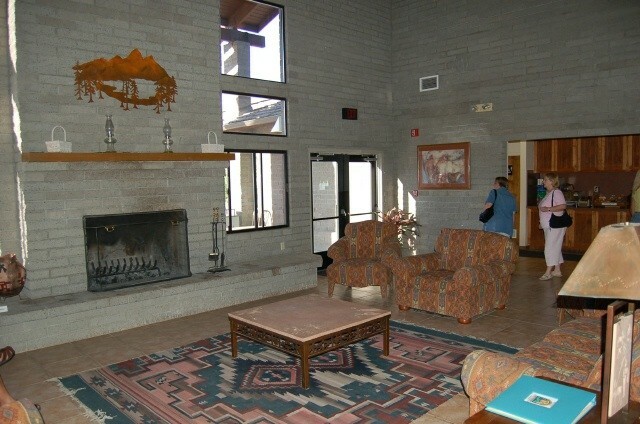 Free WiFi in the lodge, but may be able to get it in parts of the campground. Allowed in RV Park, but can't be left unattended. Normal leash and clean-up rules apply. Not allowed in any lodging, except ADA assistance dogs. Dump available at campground.. Not on base - no services. Lodging prices vary by type of unit, day of week, and season. 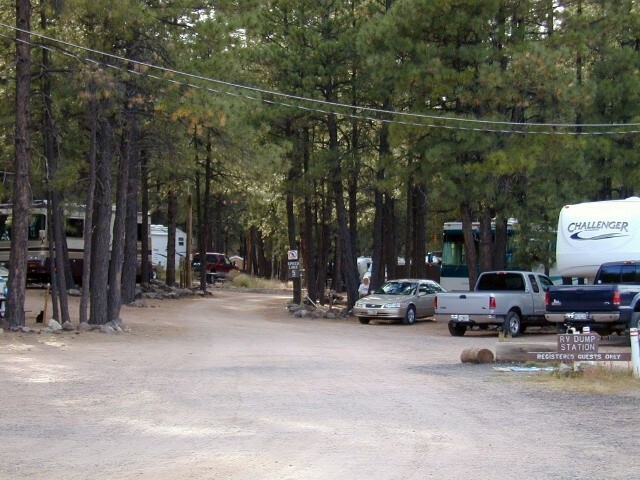 Campsites are located in the back of the facility, nestled in the pines and close to hiking trails. Showers are $2 for non-guests. Summer rates valid May through September, Winter rates valid October through April. Campground is CLOSED in the winter - cabins and hotel is open. 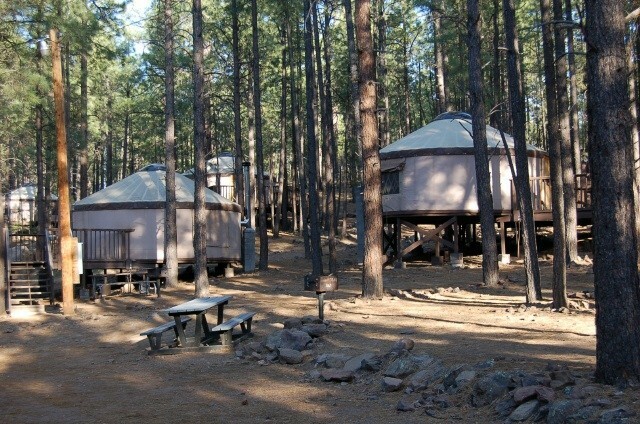 This is my 3rd visit to this hidden little gem just south of Flagstaff, if you are looking for multiple levels of camping this is the place from Hotel (does not have AC) to A-frame cabins fit about 8 people, smaller Cabins, Yurts and campgrounds. it is not designed for the monster motor coaches, but has an array of sites to fit most needs. 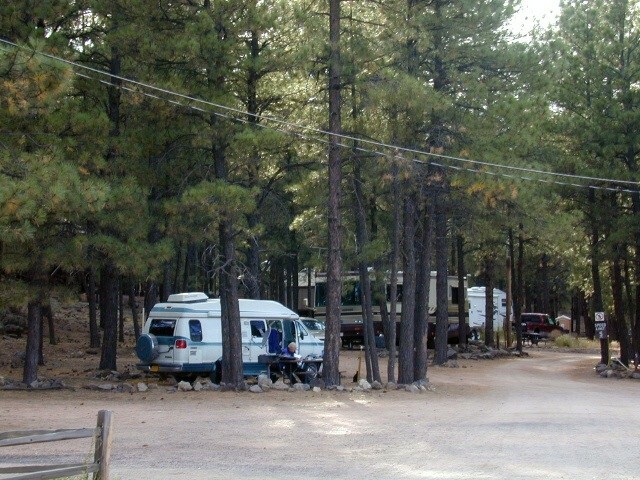 Campgrounds are not huge but nicely hidden in the pines. The staff is always courteous and kind. They are more then willing to let you know what is going on in the local area. If you want a relaxing place with the sounds of kids playing and a dog barking every once in awhile this place is heaven. It is one of my favorite places. 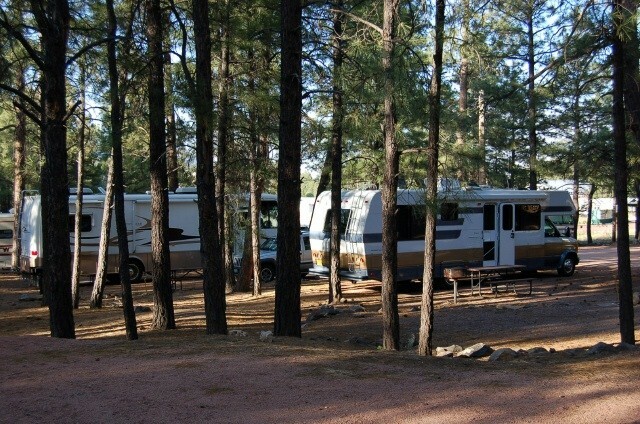 Campground is in a great location to visit the Grand Canyon and Walnut Canyon National Parks, Sedona and Flagstaff. Needs some updating for current RVs--larger rigs can fit in of the sites but only one has 50 amp hookup and none are full hookup. There was so much dust that it was not pleasant to set outside. We spotted a water truck keeping dust down in the area; they should use in the campground or contract to cover the campground (if it belongs to a different organization). Our second stay here. Just wish they'd cut some of the small trees that make getting around with big rigs very difficult. Other than that, this is a great CG and now they're part of the FamCamp family so I got my Passport stamped! (Didn't do that four years ago.) Super location in a really interesting town. Went to all the nearby National Monuments and Parks, including the Grand Canyon, as well as visited the Lowell Observatory. Got to look at the moon through a 121 year old telescope! Thought we would add a review as there hasn't been any for a couple years. This Fam Camp was one of the nicest we have stayed at. The staff in the lodge were very friendly and check in took only a couple minutes. The Fam Camp also has a lodge, cabins and yurts. The bath house was clean and great water pressure. The sites are wooded and easy in/out.Their description says they are not Big Rig friendly. They are. We are in a 40' site , traveling in a 38'Class A. Plenty of room for the RV and car. Only negative is no sewer hook up. There is a dump station if needed. WiFi is non existence in the campground.Remember you are in the mountains here.Much colder than surrounding areas. We were delighted to find that there was a military campground in the Flagstaff area as we worked our way across Route 66. Unfortunately, in our experience, location is the best aspect of this facility. The cabins, yurts, and lodge-style accommodations looked nice and seemed well utilized. The common areas and facilities appeared clean and well-kept. We found the employees to be civil but not helpful. The first words spoken to me on arrival and check-in were, "Military ID and card for payment." No "Please," "Hello," "Welcome," or other greeting. We arrived mid-afternoon and, while setting up, very loud music started coming from the common area about 75 yards away. It was loud enough that we couldn't have a conversation outside and it rattled some fixtures inside the RV. I walked down to the desk to ask if anything could be done... I was told, "They're having a wedding" without any other comment or offer to intervene (there was no evidence of a wedding in the group - just grilling and lots of kids playing). The noise went on well after dark and into the evening. The campground is well-shaded (I only found one site that had a view of the Dish western arc satellites). The roads are dirt and the 5 MPH speed limit is not enforced, so between the traffic and the wind, dust and dirt prevented us from opening windows - even though the temps were extremely pleasant. Our campsite was significantly unlevel from front-to-back, but OK side-to-side. The ground was dry when we arrived, but there were many deep, hardened ruts in ours and other campsites where rigs had come and gone on wet, muddy soil. The sites are a mix of 30- and 50-amp and we were assigned a 30-amp site. 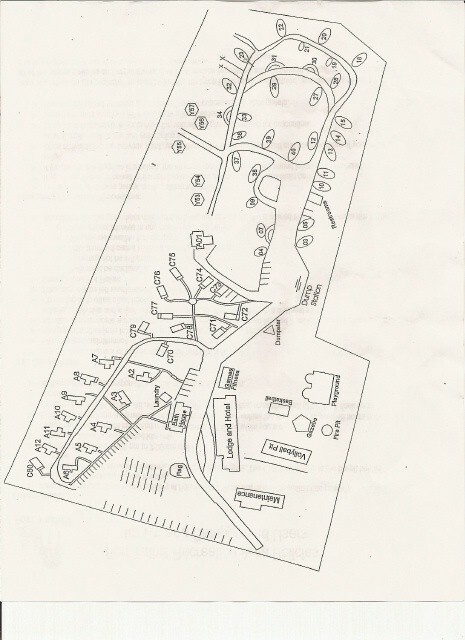 There are no sewer connections at the campsites and the dump site is laid out with the connections on the wrong side when exiting the campground. The laundry facility is clean and has four washers and four dryers in good condition. There is no place to hang clothes in the laundry and no rolling basket with a hanging bar, either. The location was convenient for exploring the area, but we probably won't stay here again. Tried several sites until settled on one that was sort of level. Not all sites have electric and water available, they are spaced around the campground. This campground is way over due an upgrade / modernization. Seems like an a bit of effort to level the sites would go a long way. 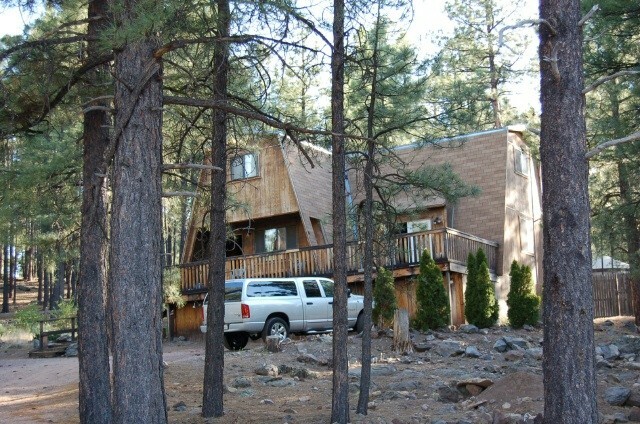 It is convenient to Flagstaff and things to see in the area. We would stay again although cost is a bit high for the quality of the campground. The staff was helpful. We just finished a five week cross country trip from FL to CA and back in May. We stayed at 9 military RV parks. All are very different. 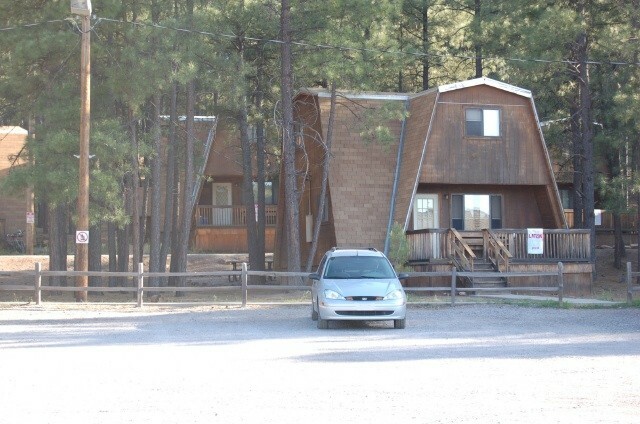 We ended up staying here two different times on our trip because of the proximity to Sedona, the Grand Canyon, Flagstaff, and Mormon Lake. The sites are not paved and not really level. There is no sewer hook ups. There is a bathhouse and some port-o-potties. It is nice and quiet. We hung out at the lodge lobby for some free wifi. The receptionist started a fire in the fireplace so it was quite a nice evening. Wal-mart is just a few minutes away for provisions. We stayed here twice this summer; on the way east and then on the return. Both times we found this site to be a great value and a peaceful, friendly retreat. The bathroom/showers were very clean. We went into downtown Flagstaff several times; less than five miles. Sedona was a beautiful drive of around 30 minutes (if I remember correctly). This was a better value than staying directly in the Sendoa area. Traveling to the south rim of the Grand Canyon was less than an hour and a half. The staff was very friendly and helpful; registration was easy. The peace and quite can change however if the park across the chain link fence is host to a large event, with many campers; we had that one night. We will definitely go back again. 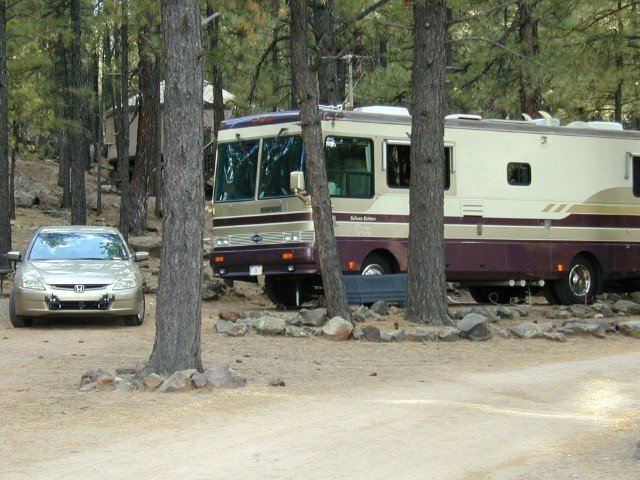 This is a nice, well-kept campground nestled in the ponderosa pines. Our site (#2) was satellite friendly, but we were unable to connect to the lodge's WiFi, even with our WiFiRanger booster. 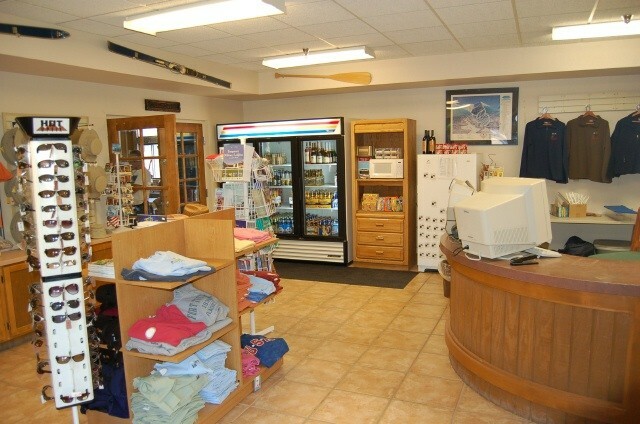 WiFi aside, the staff was courteous and friendly; restrooms and laundry clean and well maintained. Walmart and Bashas' just a short drive north on AZ 89. The recreation area is collocated with Ft Tuthill County Park where Pickin' in the Pines is a popular annual bluegrass event. Hiking trails abound, and the urban trail will take you on foot or bike to the aforementioned Walmart. I only rated amenities a three because sites are without septic hook up. If your stay takes you beyond the capacity of your tanks, breaking camp to dump can be a pain. 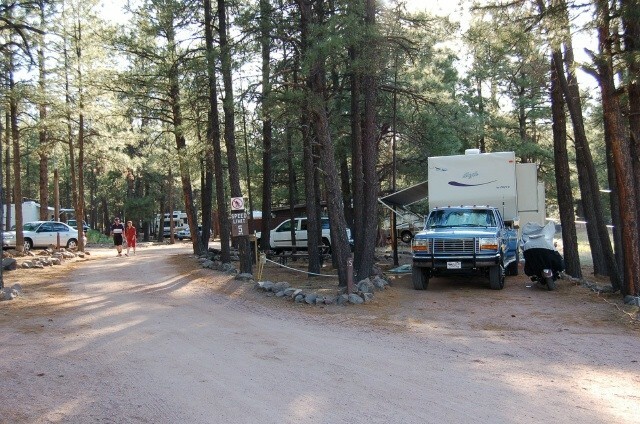 Overall we thought this campground was a good value and will visit again. My plan was to stay in one of the Yurts they have available for camping on the premises. My visit was just after a snow storm and none were available until spring. So we had to stay in the Lodge, very nice facility with very nice amenities. I would stay there again anytime of the year. My wife and i had a great experience at Ft Tuthill. We spent one day visiting the Flagstaff area and one day visiting Sedona. The park is in a great position to get to both of those. We've been to the Grand Canyon before so didn't do it that time but it's also well located to do a day trip. The day we left we were told several thousand AA members were going to be visiting the civilian part of the park; just a chain link fence away. That could have been pretty loud. We would stay there again. We arrived expecting a dump overrun by teenagers (by previous reviews). It IS an older CG without the concrete pads many of us prefer, but it's extremely quiet and peaceful (there were only five other RV/trailers and very few in the cabins). We had no trouble getting our 38' Montana into our site, nor parking our full size bed & crew cab pickup in front of it. There are nature trails that wander about the old post's grounds. The laundry facility isn't new, but everything worked well. Front desk staff was friendly & helpful. Dump station is conveniently located for when leaving. Our AT&T hotspot worked well and there's plenty of over the air television too. Very disappointed in this visit. I was surrounded by 10+ loud obnoxious juveniles in tents that were in the RV section that continued to be out of control until midnight. My grand daughters were scared and unable to sleep in my trailer. I reported the disturbance twice to the office, only to be told that quite hours were not until 11 PM. Don't expect to be able to rent a space in the RV section since the management does not care if a tent is given a 40 RV space. They are only interested in selling spaces, regardless of the type of occupant. I counted 4 tents in 40 feet RV spaces during my stay. I was forced to move into a cabin for one night because of the lack of availability of an RV space, even though I observed a vacant RV space for the 24 hrs that I was in the cabin. When I asked about the vacant space I was told it was occupied, Yeah Right. There are special needs juveniles that are given access to the campgrounds even thought they are non military. 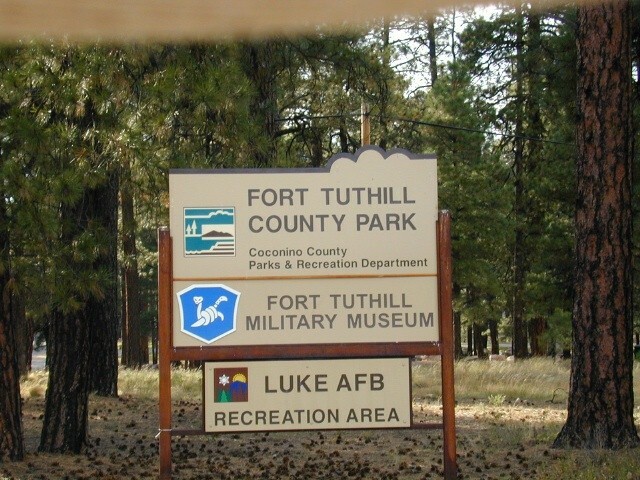 Do not plan a trip to the Fort Tuthill cabins in the humid season, July/August. you will have a very miserable stay. The Fort Tuthill management decided that the previously installed air conditioning units in the cabins were no longer cost effective, forget the comfort of its' occupants. Instead you get one ceiling fan to push around the hot humid air, no circulation of outside air. We were totally miserable in our one night cabin stay, had we were forced to open windows during a monsoon rainfall. Very hot, nearest comparison would be sleeping in your closet with the door closed, stay away in July/August. There is no mention of the lack of A/C units in their cabin ad. 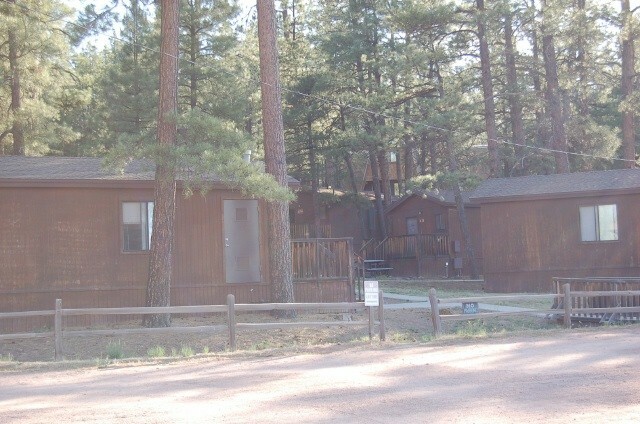 The Cabins are one room (studio style) with a full bathroom, kitchenette, couch, and a table. It accommodates four people with one queen bed and the full size pull-out couch. Towels and linens are provided. The kitchenette includes a sink, two-burner range top, coffee maker, and place settings for four. Each cabin has its own deck, charcoal grill, and picnic table. Reservations can be made online or by telephone. Please become familiar with our eligibility requirements prior to making reservations. Pets and smoking are prohibited in all lodging units. This unit is subject to a 48-hour cancellation policy and an early departure penalty. Failure to cancel 48-hours prior to arrival or early departure will result in extra charges. J.H. left this review using the Directory software: - We spent four nights at the campground in July 2014 and had a very good experience. They are doing some construction at the entrance directly off I-17 so you need to go a few hundred yards to the North entrance, which was not really a problem. This is a busy family campground, so there are a lot of children and dogs, but we did not experience any issues with loose dogs or people not cleaning up after their dogs. We used the laundry facility and it has just been painted. Machines were older, but all were functional and the area was clean. Restrooms worked fine and were clean. We saw a lot of ongoing maintenance being performed on the grounds. The staff was friendly and helpful. We found this a great base to visit Sedona, the Grand Canyon South Rim, and Meteor Crater. It may be of value for others to know that RVers are pretty uncomfortable at Fort Tuthill, and it is not because of the camp hosts. On the contrary, without Paul and Jean I would not have been able to pull my 28' Winnebago into the unlevel site on a very odd angle and jammed between other RVs. I even had to have help getting out (for the first time since I began full-timing it 1 year ago), which I did earlier than planned because I couldn't take all the (probably 15+ total) dogs and their irresponsible owners. I felt particularly bad for the couple in their tent, which was set between the yurts and the RV sites. Imagine how noisy it was for them (one guy decided that playing bagpipe tunes on his recorder was a good idea)! OY! Really??? 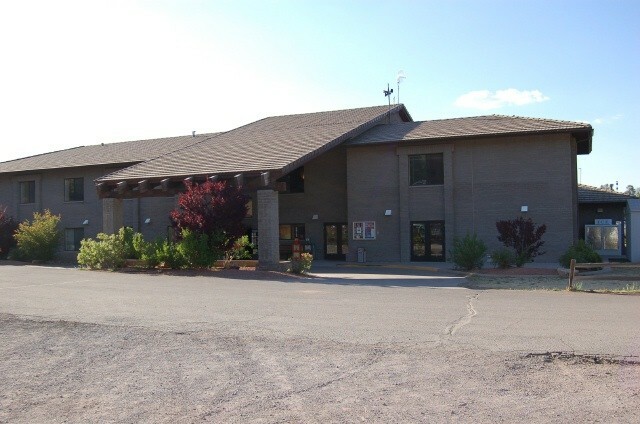 The Flagstaff area is just 3 miles to the northeast of Fort Tuthill with easy access via a frontage road that parallels I-17, and is also a great area to tour, particularly the Lowell Observatory night program, the historical museums, and a visit to Sedona are worth your time. Flagstaff has a bunch of fun thrift stores, antique shops, a Walmart and, just 8 miles west on I40 (aka Route 66), a Camping World. The Grand Canyon is a day-long outing to the south rim, and FT is a fine place to park your stuff in the meantime. But...for RVers, Tuthill is far from ideal. Theoretically, you can squeeze a Class A rig in there...but at your peril because of the angles and tree branches. And you can certainly pull in a Class B, C or towable of any length, but beware: it's crowded, noisy, unlevel, dug out of silty dirt that gets onto everything you own, and chock full of dogs. To top it off, there is no black water hook up. The good news? It's really fun for kids....and doggies. N.D. left this review using the Directory software: - Nice quiet facility. Not the Hilton, but clean, well run, and friendly. Okay, here's my Clint Eastwood review for Ft Tuthill: The Good: We tent camp and Ft Tuthill has many good tent camping sites. There are port-a-potties near each site, and there is a bathhouse within walking distance, as well. They have Yurts that have wood stoves, refrigerators, and microwaves in them. 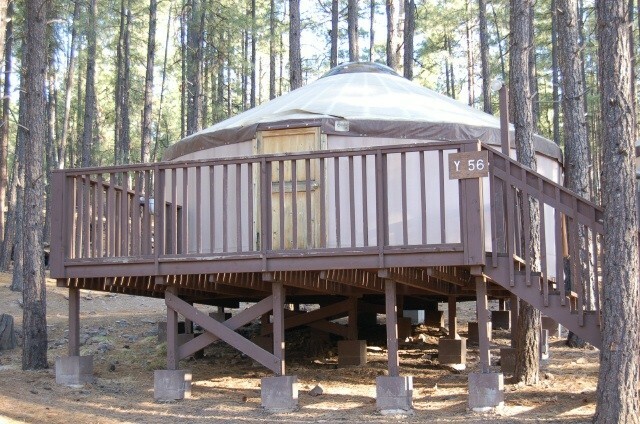 For those not in the know, a Yurt, is a big tent on steroids. It is a round structure that sleeps four in bunks and probably 4-6 more in sleeping bags on the floor. I think they are a best buy in the off-season ($25/night). They also have a first-rate lodge/hotel facility that has a huge warm lobby with a nice fireplace, an upstairs portion with TV and pool table, a camp store, and a computer room replete with wifi and a couple of computers with printing capabilities. There is also a recreational area in back of the lobby, and rest rooms just off to the side of the lobby. The staff here are great and seem to go out of their way to be helpful. The Bad: This is where I hate how they tie in the cleanliness and hospitality marks, because the hospitality is great, the cleanliness is hit and miss, at least in the bathhouse. The showers in the men's room have loads of hot water, but one of them is broken, and the toilets don't seem to flush right. Even when you hold down the handle, like it tells you to, a couple of the toilets still flooded and got stuck on me. Fortunately, there was a plunger nearby. Also, the Laundry facilities are antiquated, with one of the four washers broken and two of the four dryers broken. Even the washers and dryers that did work squealed, rocked, rolled, and shook like a California earthquake. The laundry facility was clean, though; I'll give them that. I would also consider getting rid of the 1980's video games upstairs above the lobby and put in a couple of video game/X-Box consoles like the USO does. It IS 2013, after all; not 1983. The Ugly: This is the part I hate, because it pits pet owners against non-pet owners and both are fiercely loyal to their beliefs. BUT, here it goes....there is a big problem with pet owners letting their animals (dogs, mostly) run free in the campground, bark incessantly, and not clean up after they do their doody. Pet owners REALLY need to pick up after their pets and respect those who are NOT pet lovers and don't appreciate stepping in dog poop; especially, in places where there shouldn't be any dog poop. 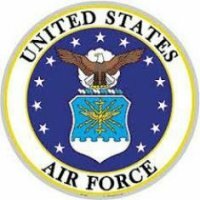 Maybe they could adopt a policy like Travis AFB Fam Camp employs and segregate pet owner sites and non-pet owner sites, to keep them in separate areas of the park. The other alternative would be to ban pets altogether, which a LOT of parks are now starting to do! Overall: A good experience, with issues that need to be addressed. Tent camping is still a great value at $9/night, but the facilities need a good going over and the pet issues need to be resolved. The staff is absolutely wonderful, cheerful and happy, and the main lobby is outstanding. Our only concern was it's a bit tight for big rigs. The folks here were very friendly, they cooked up burgers and dogs for everyone on Friday. Nice way to meet your fellow campers. The camp sites were neat and orderly. We here early in the season and they have porta-potties set up while they get the bathrooms in order. Might be an issue for non-self contained campers but we didn't hear anyone complaining. We enjoyed our stay very much. Won't stay here again. Tired of having to pick up dog poop from owners who think they can get away with not picking up after their pets. We arrived without a reservation because we were traveling and not knowing when we would stop for the night. We went through a heavy rain between Page and Flagstaff, which caught up to us just after we finished our hookups. There was a full length Class A just across from us, so big rigs can be accommodated. If you own one I would definitely recommend that you call for reservations. We had 30 amp service. While walking through the campground I noticed a rv site with no hookups, if you are just passing through, and can dry camp, you might ask the desk about this. 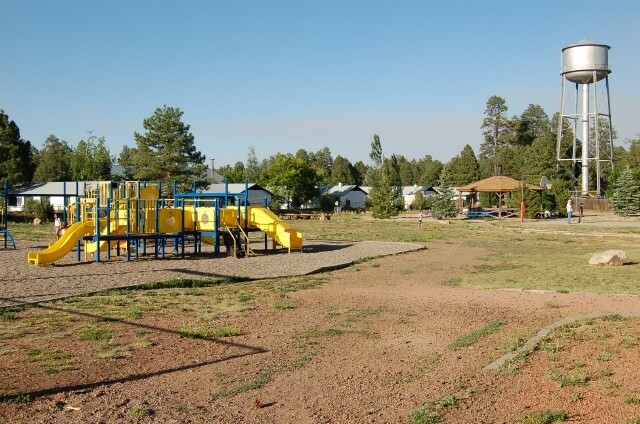 If you are passing through the area on I-40, or planning on seeing the Grand Canyon, this campground is easy to get to. I first used this campground in 1993 using the yurts, followed by tent camping. This was my first time in a RV. Luke AFB does put your money back into the campground. Trees have been thinned to widen the roads, but you still must proceed slowly and use a spotter to get situated on your site. The retail store was under construction while we were there. If you are tired of parking lot style RV parks come see this one.